Chinatown – O Hei There! Banh mi has to be the greatest value food. EVER. Subway often has their $5 footlong promotions, and it’s popularly considered the cheapest sandwich of its kind. Well, sorry to ruin you Americans’ day, but for those five dollar you can get at least two banh mi in SGV. In fact, if you’re paying more than $3 for a single banh mi, it is legitimately considered highway robbery (except at Mendocino Farms/Nong La/Red Medicine I suppose, because of location and quality of ingredients). At roughly 10 inches or so in length, typical banh mi isn’t a footlong in length, but neither were Subway’s sandwiches for the longest time. 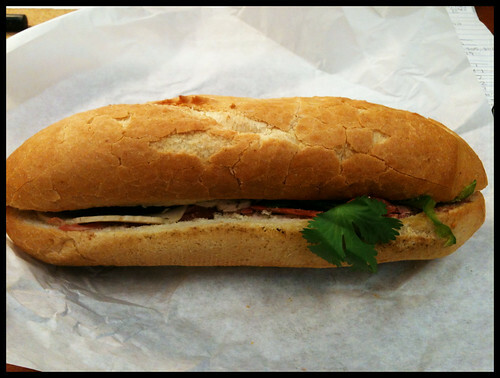 But you get a variety of Vietnamese “exotic” cold cuts, pickled veggies, fresh cilantro and jalapeno, and mayo on a freshly-baked French baguette. For less than $3, tell me that’s not amazing. It’s actually hard to find a banh mi that’s NOT acceptable in SGV, but banh mi is something I’d consider hard to master. The best version of the banh mi, however, is actually located in (the ever-increasingly-Vietnamese) Chinatown at Buu Dien. For $2, you can get the dac biet (basically means “house special”) banh mi, which has an impressive assortment of headcheese, cha lua (pork roll), liver pate, and sliced pork (those of you who want chicken or BBQ pork or whatever, you’re all fools), along with the requisite veggies and mayo that tastes homemade (either that, or the mayo is jazzed up with more vegetable oil and/or egg yolk + black pepper). Maybe it’s some magic spell put on me by the nice little old Viet sorceress that takes her sweet time making each of these banh mi one-by-one, or maybe it’s the understated but essential baguette that’s crisp and soft at the same time, but this banh mi just does it for me – no gimmicks needed.